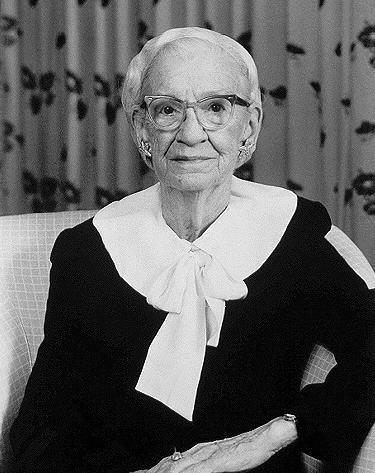 Grace Brewster Murray Hopper was born in New York City on December 9, 1906, to Walter Fletcher Murray and Mary Campbell Horne Murray. The oldest of three children, she was intensely curious at an early age. Even at age seven, she showed a particular love for gadgets, disassembling seven alarm clocks in the attempt to determine how they worked. Hopper's parents provided a strong foundation for her inquisitiveness. She shared her love of math with her mother, who studied geometry by special arrangement when serious study of math was still thought improper for a woman. Her father, a successful insurance broker despite the double amputation of his legs, encouraged all his children, through his speech and example, that they could do anything if they put their minds to it. He inspired Hopper to pursue higher education and to avoid being limited to typical feminine roles. In 1923, at age 16, Hopper applied to Vassar College. However, she failed a Latin exam and Vassar told her she must wait a year. Undaunted, she became a boarding student at Hartridge school in New Jersey, entering Vassar the following year. She graduated Phi Beta Kappa from Vassar in 1928, with a Bachelor's Degree in Mathematics and Physics. In 1930, at age 23, she received her Master's Degree in Mathematics from Yale University. The same year, she married Vincent Foster Hopper, an English instructor at New York School of Commerce. A year later, Vassar hired her as a mathematics instructor, for a salary of $800 per year. Hopper taught at Vassar from 1931 until 1943. During that time, she earned a Ph.D. from Yale in 1934 (with a thesis on "New Types of Irreducibility Criteria"), and was promoted from instructor to associate professor. In 1936 she published a paper on "The ungenerated seven as an index to Pythagorean number theory" in the American Mathematical Monthly. With the outbreak of World War II, Hopper made a life-altering decision to serve her country by joining the Navy. The process was not an easy one. At age 34, weighing 105 pounds, she was considered overage and underweight for military enlistment. In addition, her position as a mathematics professor was declared crucial to the war effort. Navy officials asked her to remain a civilian. These obstacles did not stop Grace Hopper. She obtained a waiver for the weight requirement, special government permission, and a leave of absence from Vassar College. In December 1943, she was sworn into the U.S. Naval Reserve. She went on to train at Midshipman's School for Women, graduating first in her class. Hopper's first assignment was under Commander Howard Aiken at the Bureau of Ordinance Computation at Harvard University. There she became the third programmer of the Mark I, the world's first large-scale automatically sequenced digital computer. The computer was used to calculate aiming angles for Naval guns in varying weather conditions. Because the numbers were so pertinent, Hopper and her assistants were often required to run and monitor the system twenty-four hours a day. They spent countless hours transcribing and inputting codes for Mark I and its successors, Mark II and III. Hopper received the Naval Ordnance Development Award in 1946 for her work on the Mark series. In 1946, at forty years of age, Hopper was told that she was too old to remain in active service. By that time, she was divorced with no children. Turning down a renewed position at Vassar, Hopper chose to remain at Harvard as a civilian research fellow in Engineering Sciences and Applied Physics until 1949. Then, Hopper made a risky business move. She left Harvard to join Eckert-Mauchley Computer Corporation as a senior mathematician. The gamble paid off when the company introduced the BINAC, Binary Automatic Computer, which was programmed using C-10 code instead of the punched cards utilized by the Mark series. This paved the way for production of the first commercial computers, UNIVAC I and II. Although great improvement had been made, programming the BINAC still proved difficult. Hopper taught herself how to add, subtract, multiply, and divide in octal, a number system with base eight that uses digits 0 through 7, in order to facilitate the process. Unfortunately, her checkbook suffered, as she occasionally subtracted an octal instead of a decimal from her balance. Hopper remained with the company when Remington Rand bought it in 1950, and later when it merged with Sperry Corporation. During this time, she developed the first compiler, A-0, which translated symbolic mathematical code into machine code. Using call numbers, the computer could retrieve subroutines stored on tape and then perform them. The A-2 became the first extensively used compiler, laying the foundations for programming languages. In 1952, she published her first paper on compilers. Hopper's next move was radical. She suggested that UNIVAC could be programmed to recognize English commands. Despite ridicule from her peers, Hopper succeeded in developing the B-0 compiler, later know as FLOW-MATIC, which could be used for typical business tasks such as payroll calculation and automated billing. Using FLOW-MATIC, she taught UNIVAC I and II to understand twenty English-like statements by the end of 1956. It soon became apparent that a standardized, universal computer language was necessary. In 1959, the first specifications for the programming language COBOL appeared. Members of Hopper's staff helped to frame the basic language design using FLOW-MATIC as their foundation. Hopper then helped to create standard manuals and tools for COBOL. In 1966, Hopper's age forced her to retire from the Naval Reserves. However, in less than seven months, the Navy, unable to develop a working payroll plan after 823 attempts, recalled Hopper from retirement in order to help standardize the high-level Naval computer languages. Her reinstatement made her the first Naval Reserve woman to return to active duty. Her original re-appointment was for six months, but it was later extended indefinitely. During her remaining years with the Navy, Hopper aided in the production of a generally accessible COBOL certifier as well as translator programs to convert non-standard COBOL languages into the standardized version. In 1983, by special Presidential appointment, Hopper was promoted to the rank of Commodore. Two years later, she became one of the first women to be elevated to the rank of Rear Admiral. In 1986, after forty-three years of service, RADM Grace Hopper ceremoniously retired on the deck of the USS Constitution. At eighty years, she was the oldest active duty officer at that time. She spent the remainder of her life as a senior consultant to Digital Equipment Corporation. Hopper received numerous honors over the course of her lifetime. In 1969, the Data Processing Management Association awarded her the first Computer Science Man-of-the-Year Award. She became the first person from the United States and the first woman to be made a Distinguished Fellow of the British Computer Society in 1973. She also received multiple honorary doctorates from universities across the nation. The Navy christened a ship in her honor. In September, 1991, she was awarded the National Medal of Technology, the nation's highest honor in engineering and technology. However, over all these distinctions, Hopper claimed her work as a teacher as her most important and rewarding accomplishment. Admiral Hopper's perseverance and unconventional style led her to great achievements in all her professional endeavors. Never forgetting her father's example, she took on the established system and won. A true pioneer, she helped to pave the way for modern computing, as well as professional women everywhere. Hopper truly lived up to her motto "Dare and Do." Rear Admiral Grace Brewster Murray Hopper died January 1, 1992. She was buried with full military honors at Arlington National Cemetery. Watch "The Queen of Code" video, the story of Grace Hopper told as part of the FiveThirtyEight's "Signals" film series (16 minutes in length). Auel, Asher. "The Mathematics of Grace Murray Hopper," Notices of the American Mathematical Society, Vol. 66, No. 3 (2019), 330-340. "Admiral Grace Hopper: A Select Bibliography,", Naval History and Heritage Command website. Grace Murray Hopper, 9 December 1906 - 1 January 1992,", Naval History and Heritage Command website. Dickason, Elizabeth. Remembering Grace Murray Hopper: A Legend in Her Own Time, CHIPS, April 1992. Dickason, Elizabeth. Looking Back: Grace Murray Hopper's Younger Years, CHIPS April 1992. McKenzie, Marianne. "The Amazing Grace Hopper," Grace Hopper Celebration of Women in Computing, 1994 conference proceedings. Women of Mathematics: A Bibliographic Sourcebook, Louise Grinstein and Paul Campbell, Editors. Greenwood Press, 1987. Kidwell, Peggy Aldrich. "Stalking the Elusive Computer Bug," IEEE Annals of the History of Computing, 20:4 (1998), 5-9. Kalemaris, Agnes M. Grace Murray Hopper, Mathematician, D.A. Dissertation, Adelphia University, 2000. Colt, Elizabeth. "The Graceful Admiral," Boston Globe, June 21, 1986. Reprinted in the AWM Newsletter, Vol. 17, No. 1 (Jan/Feb 1987), 7-8. Zaslavsky, Claudia. "Who invented COBOL?," AWM Newsletter, Vol. 19, No. 1 (Jan/Feb 1989), 3-5. Koch, Laura Coffin. "Grace Brewster Murray Hopper," Notable Women in Mathematics: A Biographical Dictionary, Charlene Morrow and Teri Perl, Editors, Greenwood Press, 1998, 80-85.